A fruit sorbet is one of the simplest of puddings to make; you just have to be patient while the mixture freezes. All sorbets are made on the same principle of freezing a sugar syrup flavoured with fruit juice or purée, so once you've mastered the simple technique, it's quite easy to create your own sorbets. Just bear in mind that the tarter the fruit, the sweeter the syrup must be, to balance its flavour. A classic lemon sorbet like this makes a great, light summer pudding, but is also excellent as a palate-cleanser between two savoury courses. Put the caster sugar and the water in a small saucepan and over a medium-low heat. Heat the pan gently, stirring, until the sugar has completely dissolved. Bring to the boil and boil steadily for 5 minutes (without stirring), or until the solution has attained the consistency of a thin syrup. Leave to cool, then stir in the lemon juice, and the lemon vodka. Pour the lemon mixture into an ice cream maker and process following the manufacturer's instructions. Alternatively, if you don't have an ice cream maker, pour the lemon mixture into a shallow container and freeze for an hour. Remove from the freezer and beat with an electric mixer until smooth, then return to the freezer. 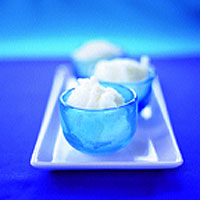 Repeat this procedure twice to produce a smooth, fine-textured sorbet, then leave to freeze until very firm. Serve in scoops. If you can't wait for a tangy scoop of lemon sorbet, opt for Waitrose Lemon Sorbet (£2.59/750ml), which is made with fresh lemon juice. Serve it with a drizzle of blackcurrant coulis or a buttery chocolate biscuit. Waitrose sorbets also come in raspberry and mango flavours.